Two weeks ago I wrote to the NSA and requested my phone records and any records of my Internet activity via a Freedom of Information Act request. 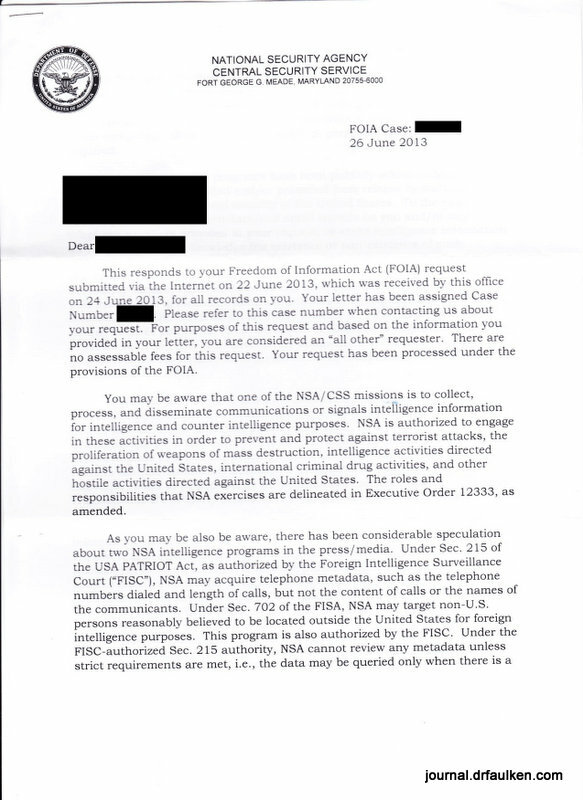 On June 26, 2013 the NSA denied my FOIA request and refused to confirm or deny that they had any information about me. I’ve redacted my case number and personal information so you can read their full FOIA denial. Page one of the three page letter denying my FOIA request. The NSA rattles the fear saber throughout the letter, stating that answering my request could warn terrorists that the NSA was watching them. I didn’t expect the NSA to co-operate, but if this is their reasoning, then why have an FOIA request process at all? I feel like I have a right to see what the government has or has not collected about me, especially since we know that the “safe guards” in place at the NSA really don’t amount to anything. I don’t believe the NSA is only collecting information on communications involving a foreigner, and I want to know what they have been collecting. Please contact me if you are a lawyer and/or represent a legal foundation attempting to find out more about PRISM or any other wide-net surveillance of American citizens. 1 Comment on "The NSA Responds to My FOIA Request"